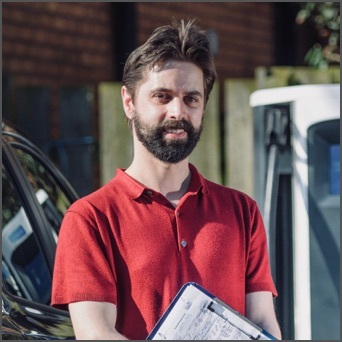 I write articles for magazines/organisations inside and outside the driver training industry related to electric cars and special needs. I attend courses related mainly to SEN and join in debates on podcasts and forums to expand my own experience. I have a profile on the specialist Disability Driving Instructors website. All driving instructors are encouraged by the Driver and Vehicle Standards Agency to engage in continuous professional development. As an element of this I am an active member of the Nottingham and Derby Driving Instructors (NDDI), the Driving Instructors Network Group (DING), and the ADI National Joint Council (ADINJC). We meet monthly and are organise varied driver training related events and courses to further our personal training as driving instructors (recent examples would include teaching techniques including coaching skills, disability driver training, advanced driving tests and roadside 1st Aid). My name is Rob and I began training as an Approved Driving Instructor (ADI) in 2002, fully qualifying in 2005. 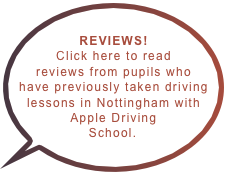 I established my own company (Apple Driving School) in 2006 and have enjoyed teaching driving in Nottingham ever since. I specialise in teaching pupils with varied learning difficulties (such as dyslexia, dyspraxia, autism, Aspergers, anxiety, ADHD and other special / specific needs) and elderly / mature drivers. I am always seeking to expand my experience. All my pupils are patiently trained to a high standard, progress is tracked throughout driving lessons using my unique 5 stage syllabus and detailed pupil records. Pupils are fully prepared for the driving test and (more importantly) safe driving for life. I am very passionate about my job, which has led me to develop a wealth of resources for my profession. This includes my 5 stage syllabus, detailed pupil records and show me tell me resources. My personal aims for 2018 are to study further ‘special needs driver training’ (particuarly dyslexia and dyspraxia) and expand my experience working with mature / elderly drivers. Click here for my recent personal training and development. Every year since 2014 I have taken part in The Big Learner Relay for Children In Need. I work very hard to make sure I am reliable and punctual. for in full, and often a bit extra. the time of your lesson. and all driving tuition will be on a 1 to 1 basis. suit the needs of each and every pupil. I will always be patient, friendly and cheerful! I abide by the official ADI Code of Conduct.